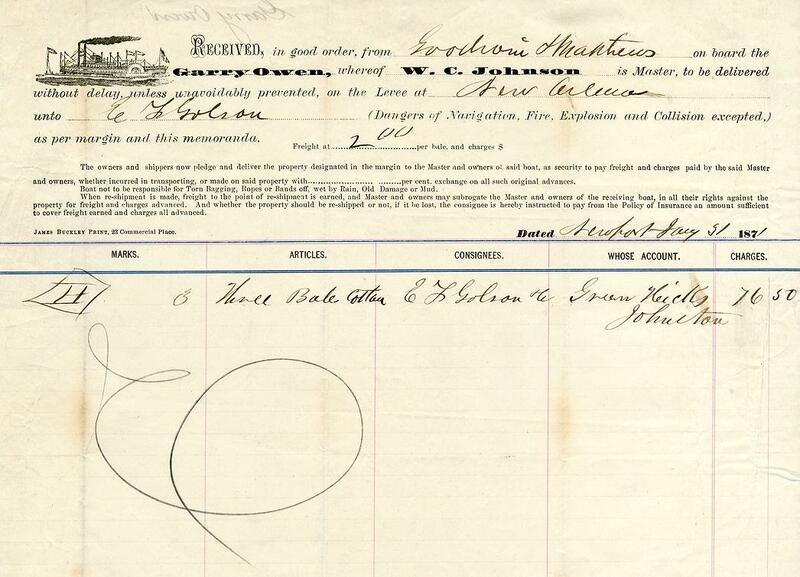 Waybill for 3 bales of cotton at New Orleans, month and day are illegible but the year was 1871. See name origin from the familiar Irish "air" that became associated with the U.S. cavalry and General Custer. Built at Wheeling, West Virginia in 1870. 131 x 32.5 x 4.4. First master, Capt. J .W. Carlton of New Orleans who owned a share along with Charles B. Harrington and Nick Benchman, also of New Orleans. Ran New Orleans-Ouachita River, and in 1873 was at Alexandria, La., on Red River. Reported sunk by a tug at New Orleans, Feb. 4, 1876. [Garryowen is known to have been used by Irish regiments as a drinking song. The name is derived from Gaelic meaning Owen's garden, and is nowadays part of Limerick city. That was where the 5th Royal Irish Lancers made their home, and soon the song became associated with the Lancers' drinking. The Irish poet Thomas Moore wrote the words around 1807. The tune is first documented as Auld Bessy in 1788. Built at Cincinnati, Oh., 1875. 462.79 tons. 202.4 x 36.4 x 5.2. Owned by the Shinkle family. She frequently carried baseball crowds from the foot of Walnut Street in Cincinnati to the East End where the field was located near what later was the Cincinnati Gym property. In the latter 1870s she ran competition for a time with the JAMES FISKE JR., in the Paducah-Cairo trade and lost out. Her owner at the time was a Mr. Byrd who joined forces with circus man Dan Rice. They transformed this sidewheeler into a showboat and toured the South with it. She was still listed in 1886. Note: CHAMPION No's. 7 and 8 were both towboats. Under the ownership of Merchants & Planters Packet Company she ran tri-weekly New Orleans-Baton Rouge. Under ownership of Mississippi Packet Company, she ran New Orleans-Bayou Sara semi-weekly. John F. Klein ran her on excursion at St. Louis in 1914, then ran excursions at Pittsburgh and the upper Ohio in 1915. Built at Dubuque, Iowa in 1899 by Iowa Iron Works, the engines by Clinton Novelty Iron Works; her 3 chime whistle came from the STELLA WILDS. 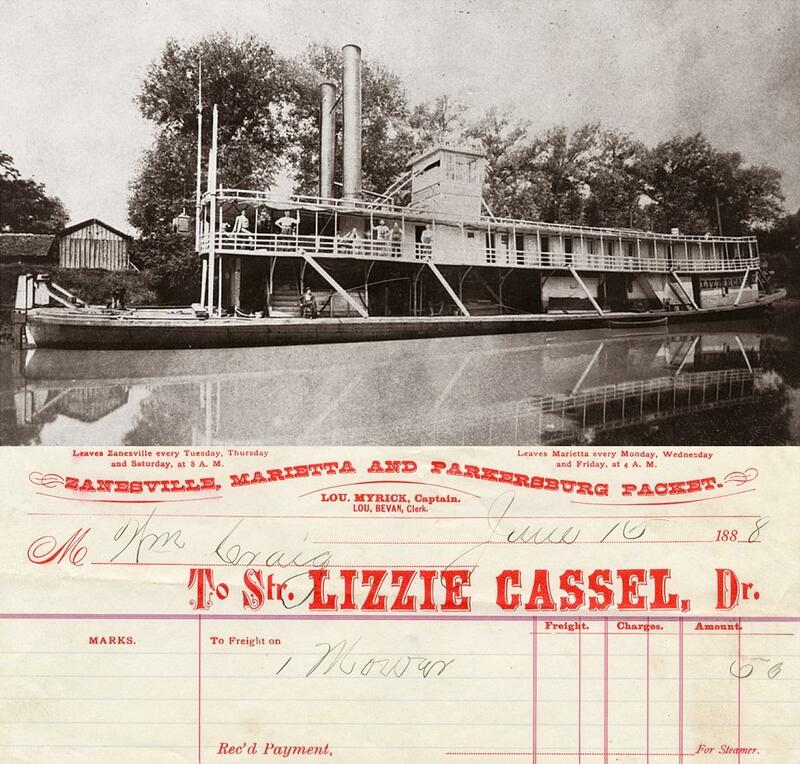 The BETSY ANN was first owned by R. F. Learnerd of Natchez, Mississippi, and named for his wife Elizabeth; Learnerd ran the BETSY principally in the Natchez-Bayou Sara trade and carried U.S. mail. She was sold in the fall of 1921 to D. Grover Gill of Gallipolis, Ohio, and others who ran her Pittsburgh-Portsmouth, then Pittsburgh-Cincinnati, incorporated as Independent Packet Company. Frederick Way and Frederick Way, Jr. bought stock in late 1925 and continued running her Pittsburgh-Cincinnati into 1929. She ran Pittsburgh-Louisville in the summer of 1930, then Pittsburgh-Charleston, and finally returned to the Pittsburgh-Cincinnati trade November 3, 1930 through April 25, 1931. She left Pittsburgh November 2, 1931 and went to Memphis under charter to tow cotton. She made one trip to Caruthersville and another to Vicksburg, returning to Memphis December 6, 1931. She was sold to John I. Hay Company, spring 1932, and was put to towing barges. She was dismantled at the St. Louis wharf in fall 1940. The boat is best remembered for having run three staged races at Cincinnati, on July 24, 1928 with the packet CHRIS GREENE, on July 16, 1929 with the packet TOM GREENE, and again in 1930 with the TOM GREENE. These events led to the "rebirth" of steamboat racing as a popular sport. 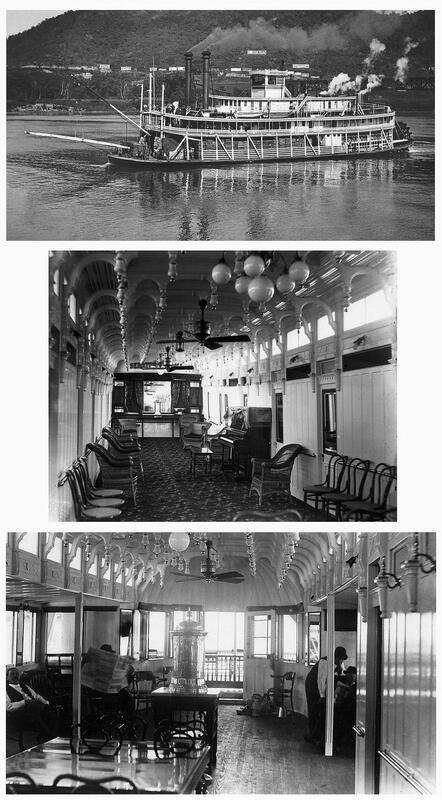 These photos of the SENATOR CORDILL are beautiful not only as photos but the boat herself was so curvaceous on the outside and inviting on the inside.The interior surfaces shine and the ambiance/atmosphere is enthralling, in these pictures the cabin looks like you could walk into it, the depth and detail is seemingly three dimensional. Truly remarkable. All 3 are Murphy Library treasures. Iowa watercolorist James Cline's undated painting of the SENATOR CORDILL.Image area seen here in rotated cropped format approximately 16 x 20 inches. "In memory of this big lady, let it be said this scribe (who was master-pilot on her three months in 1931, and pilot in 1932, '33 and '34) she was the most comfortable and satisfactory pile of lumber to pilot that I know about. In high wind she was as deliberate as a turtle. She had pretty engine room bells, a most wonderful whistle - she was one of the very few steamboats I really anticipated coming on watch on, day or night, rain or shine. There is a complete story of the SENATOR CORDILL with many photographs in S&D Reflector, March 1971 issue, pages 13 - 25. She was a stately looking steamboat with double swinging stages. 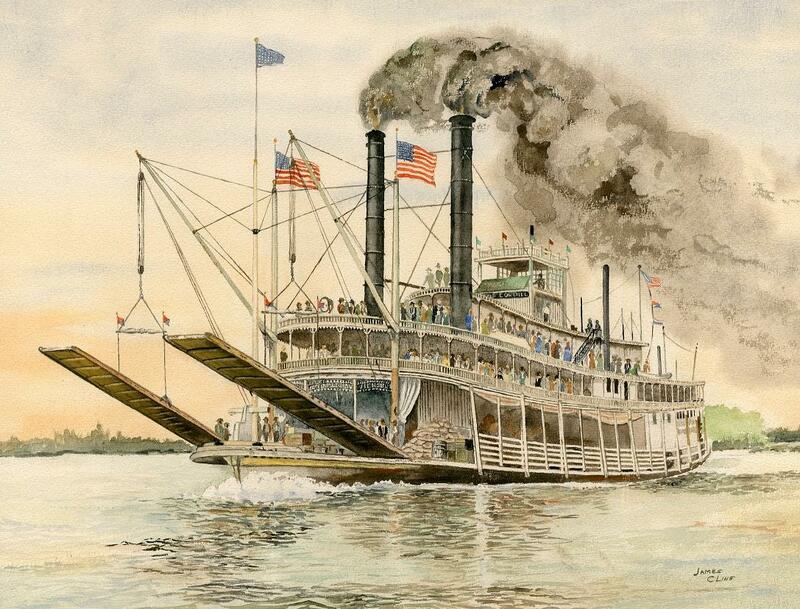 In the beginning she ran Vicksburg-Natchez tri-weekly and also handled U.S. mail. On January 27, 1903 she participated in a parade and celebration when the Yazoo River diversion put Vicksburg back on the map. In 1912 her engines were replaced by compound non-condensing engines and she was lengthened in 1925 at Point Pleasant, West Virginia. In March 1918 she sank near Vicksburg and was raised by Captain George Wilson. In July 1920 she was sold to a group of upper Ohio River produce dealers and entered the Pittsburgh-Charleston trade. In 1929 she teamed up with the QUEEN CITY and ran in the Pittsburgh-Cincinnati trade at various times until 1933. Captain Fred Hornbrook then ran her under lease in the Pittsburg-Cincinnati trade until she sank after hitting an improperly lowered wicket at Dam 14 on the Ohio River above Clarington on February 5, 1934. Three deckhands were lost. U.S. Engineers raised her and towed her to Marietta. 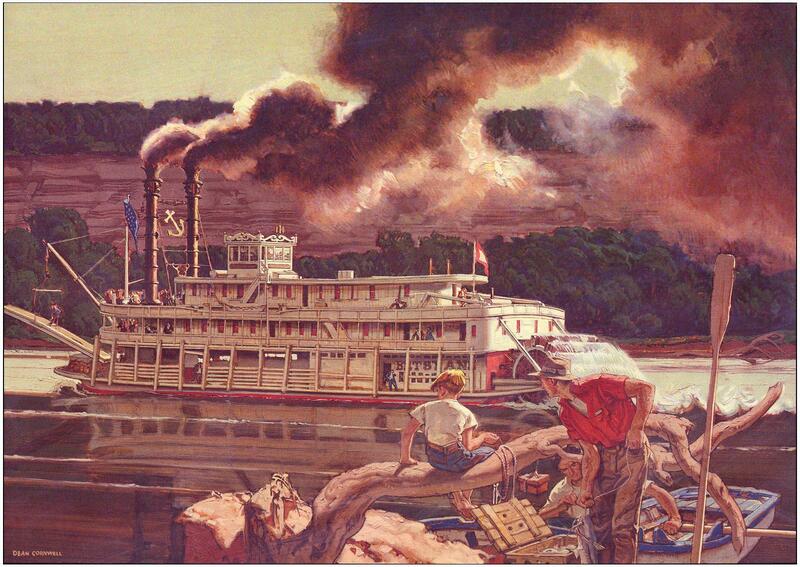 Two steamboats called ALBATROSS are represented in the La Crosse collection. One was a huge railroad transport sidewheeler and the other a small sidewheeler that plied the Fox River. "In the late nineteenth century a series of locks were built in Wood and Wirt Counties, creating 'slack water' for steamboat traffic up the river as far as Creston." So it seems likely that the ALBATROSS only operated as far up river as Creston, West Virginia. "Around the turn of the century, Norm Williams, devised a new type of watercraft which was used for several decades to provide transportation on the Little Kanawha above Creston. In 1897, Mr. Williams, a Calhoun County native, purchased a bateau that had been used to transport freight up the West Fork of the Little Kanawha as far as Richardson. The new watercraft was built on the bateau which was later sunk, thus permitting the new craft, the first gasoline powered boat, to be floated. This gas boat was powered by a four-horsepower stationary type engine located in the center of the boat. 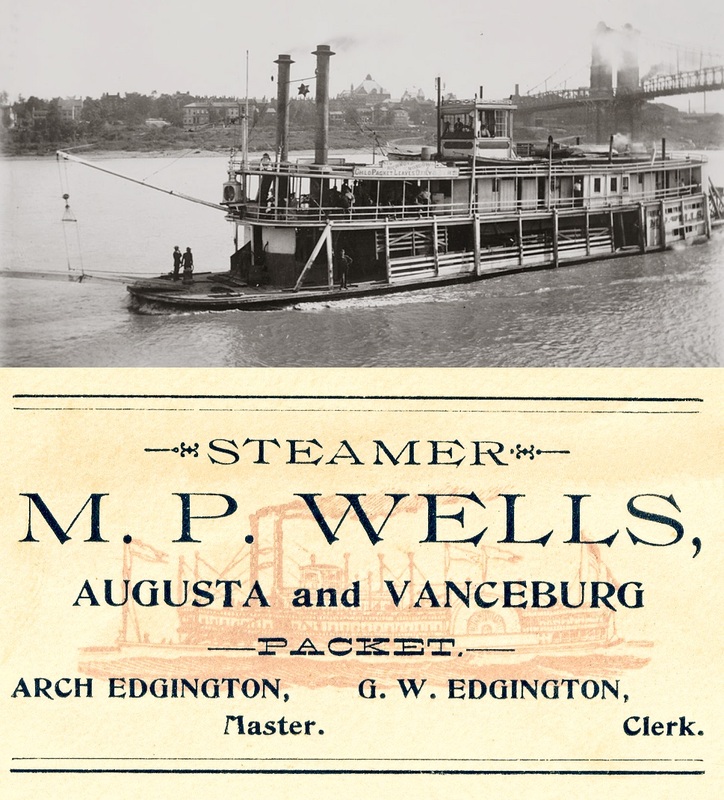 It was propelled forward and backward by looping two belts over a pulley with the belts running to the stern of the boat and across two idler pulleys thereby turning the paddlewheel. One of the belts had a half-turn in it, and the other was straight. By shifting the straight belt to an idle pulley attached to the paddle wheel by a chain, the boat could be made to move backward. When the belt with the half-turn was shifted to the idle pulley, the boat would move forward. Since this small light-weight craft required much less water depth, it was now possible to navigate the upper reaches of the Little Kanawha. Today it seems impossible that navigation existed upriver as far as Burnsville, or on the waters of Steer Creek as far as Lockney. However, it was only possible to reach the upper reaches of these streams during one of the many "mud rises" which occurred frequently, particularly during winter and spring. Goods were stored along the riverbanks and when the "rise" occurred, gasboats from downriver arrived upriver with imported goods, and the goods for export were loaded and transported downriver. With the introduction of the gasboat, the Little Kanawha became a busy commercial highway for the area above Creston. The lumber and petroleum industries flourished during this period. Timber and wood products such as cross ties and barrel staves were exported via the river, equipment and pipe for the booming oil and gas industry were transported into the area, and carbon black, one of the area's primary products was transported out. Grantsville became the boat-building center of the Little Kanawha Valley and the area prospered during the riverboat era. Not only did the river serve as a commercial highway, it also served the citizens of the area as a means of public transportation. 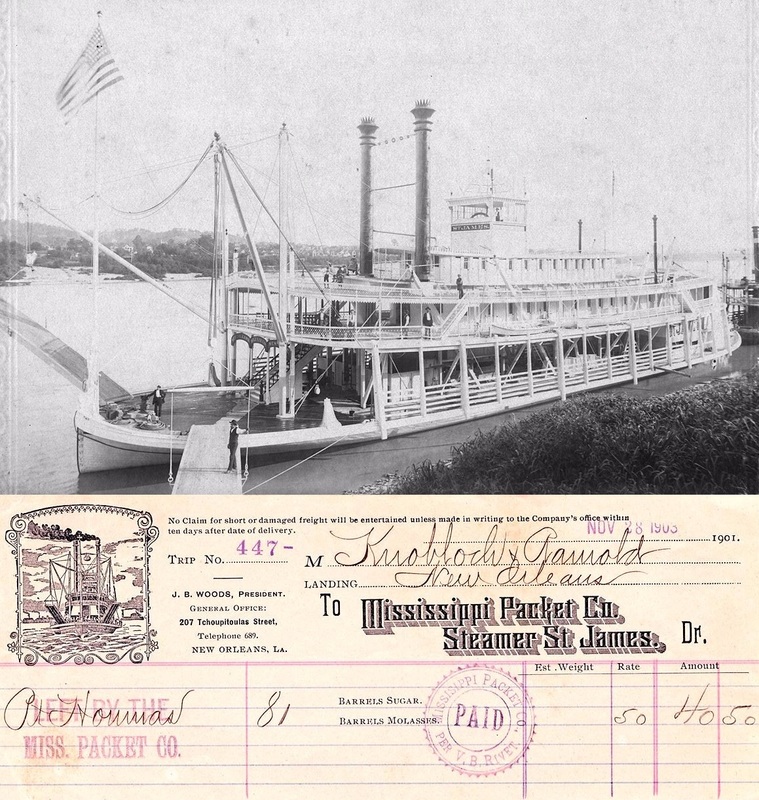 The trip to Parkersburg was a day-long journey, and it is not uncommon, even today, to find Calhoun County residents who remember riding a gas boat to Parkersburg. During World War I, men leaving to serve their country in the military were transported via a gas boat, and the boats also performed the service of delivering mail for the U. S. government. Many college students caught their first glimpse of Glenville Normal School from the deck of a gasboat. With the coming of paved highways during the late 1920's and early 1930's, the use of the river as a mode of transportation declined and today it is difficult to imagine our river as having been anything other than the stream we know today." Built at Belle Vernon, Pennsylvania, 1888 for Captain William E. Roe and M. Richter and named for a citizen of Marietta, Ohio. Originally a single deck boat, she soon was sold to the Brown family of Hartford, West Virginia, who ran her Gallipolis-New Haven. Captain George Edgington bought her in 1889 and ran her Vanceburg-Augusta. The Greene Line acquired her in 1904, rebuilt her and renamed her CHILO. Her hull was built in 1873 at Marietta, Ohio and construction completed at McConnelsville, Ohio. Her engines came from the J.H. BEST. She began in the McConnelsville-Zanesville trade in December 1873 but soon changed to Parkersburg-Zanesville. 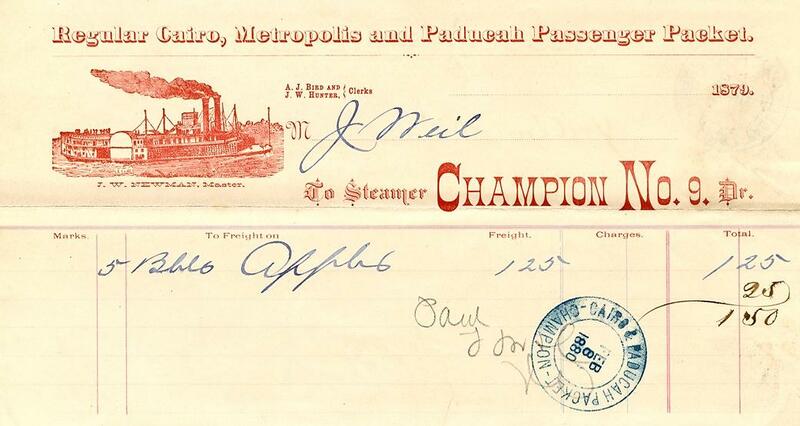 This waybill was filled out on June 15, 1888. She carried the U.S. mail until 1889. On June 12, 1886, she hit an obstruction on the Muskingum River (8 miles downstream from Zanesville), knocked a hole in the hull and sank but was raised. After she sank for the final time in July 1895 at Zanesville, Ohio, she was sold for junk for $20. Her machinery went to the Hazel Rice. Another fine musical-sounding lady's name for a steamboat.